Few names are more revered in the annals of film noir than that of Robert Siodmak. He directed some of the classics of the form: Phantom Lady, The Killers, Criss Cross. Last night Eddie Muller showed a pair of rarities that bookend the noir and Hollywood phases of Siodmak’s career. Neither one is exactly noir, but both are fascinating. The German expatriate was considering a return to Europe when he was offered Deported. One of the few studio films to be shot overseas at the time, it’s a fictional account of Lucky Luciano’s forced return to Italy following his cooperation with the U.S. government during World War II. From prison, Charley Lucky used his control of the waterfront rackets to shut down Axis spies, and his contacts in Italy provided intelligence during the run-up to the invasion. “Vic Smith,” aka Victor Sparducci, (Jeff Chandler) isn’t a player at Lucky’s level, but he did do his bit to help Uncle Sam during the war. Now he’s being sent back to the country he barely remembers, watched by the police and hounded by an ex-partner. As he falls for a beautiful contessa (the Swedish actress Märta Torén), he hatches a brilliant plan to bring the hundred grand he stashed in New York into the country. 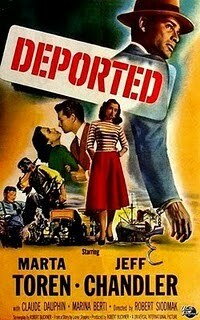 Deported is an authentic curio, and I liked it quite a bit. It feels like a European film, moving at a different rhythm. There are some striking scenes of Italy shot by William Daniels, and a sense of the deprivation there after the war. I must mention Marina Berti, bewitching as Gina. The apocryphal story is that Luciano, a die-hard movie fan, met with Siodmak during production to tell him how much he loved The Killers ... and that Siodmak used him as an extra in a movie based on his own life. I didn’t spot him, but then I wasn’t looking for him. Siodmak burst of the B movie ghetto with Fly-By-Night, a blatant attempt to cash in on Alfred Hitchcock’s success The 39 Steps. Here the innocent man caught up in espionage is played by Richard Carlson, who would go on to be a ‘50s sci-fi stalwart in It Came From Outer Space and Creature From the Black Lagoon. Nancy Kelly, mother of The Bad Seed, is the gal along for the ride. The script, by one of my heroes Jay Dratler, manages to hit all the comic suspense notes in diabolically inventive ways. And Siodmak stages some impressive stunts on a limited budget. It’s easy to understand why he was earmarked for bigger things. Fly-By-Night is a treat, one of the best faux-Hitchcock films ever made. Alas, there is exactly one (1) print of the movie in existence. Last night, it unspooled in Seattle.